You can imagine the shock and surprise I had last night (during the half-time break at the Swans v Bees of Brentford match) to be summoned onto the pitch to collect a prize! DDWT Junior had won a very large ‘Cyril the Swan’ mascot doll (picture below) in a txt your seat number competition for members of the Cygnets club (i.e junior Swans fan club). Although I was chuffed to bits that he’d won – I was rather embarressed to walk around the pitch clutching the toy, especially in light of comments such as “Got off his lead did he” and “I like your bird fella” from the chuckling hoardes. 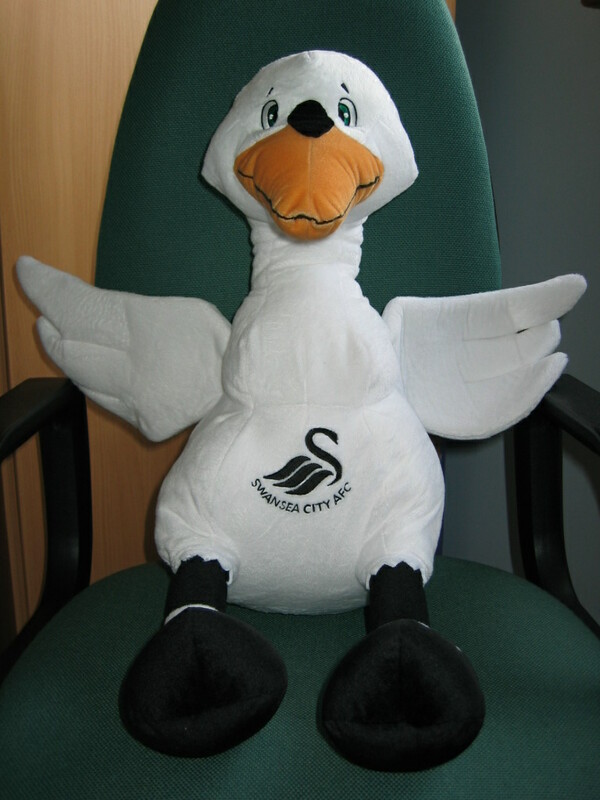 Further humiliation is guaranteed with a picture of me being presented with the doll (from Cyril the Swan) being in the next match day programme. Anyway, back to the football – a great night was had all round with the Swans winning 2-1 in a very entertaining game and an electric atmosphere to boot. Friday night games at the Vetch Field were always special and it looks like more of the same at the Liberty stadium – long may it continue. I picked up my free edition of ‘The League Paper’ (a weekly football newspaper) along with my match programme at the game and must say what a well written paper it is. It focusses on the Championship, League One and League Two with lots of coverage on the majority of clubs, with stats, match reports and guest columns as well. It’s a very good read and presents a very unbiased view – so worth the £1.20 weekly cost. It was also interesting to read Lee Trundle’s view of his career to date and how he see’s it developing longer term. Received an interesting email today from PlusNet (my broadband ISP) who are offering a free upgrade to their 8MB service for all existing broadband premier customers. It’s worth mentioning that even new subscribers can get 8MB connections for as little as £14.99 per month. Anyway, I quickly went in search of the ADSL capacity of my local exchange and was very pleased to read that it is due for ‘ADSL Max’ (i.e 8Mbps downstream and 448kbps upstream) activation on March 31st. I just hope that as I live roundabout 2km from my exchange that it isn’t going to affect the bandwidth – which is currently 2MB. So here’s hoping for 8MB.